Can you tell us more about your role – e.g. what you do on a daily basis? Basically, I make sure that all the rooms are in order. I oversee the cleaning of the rooms, and ensure that we meet the requests of our guests as best as we can. Sometimes, the requests can be quite challenging. For example, right now, we’re removing all the furniture out of the rooms on one level of the hotel because the guest requested for it. I’m also planning to start a programme to help my team be more comfortable interacting with our guests. It’s a bit challenging for some of them, because English is not their first language. They have the skills to perform top-notch housekeeping duties, but they may be less confident when it comes to speaking with guests in English. How long have you been in the industry? It’s only been a year since I made the career switch, but I feel like I’ve learnt so much. Before I became a housekeeping supervisor, I spent 22 years in the airline industry. Some people think that moving from the airline industry to the hotel industry is a “downgrade”. But to me, it’s actually an upgrade. We’re generally doing the same things – tending to guests, setting beds and keeping things clean – but on a much larger scale because obviously, hotels are bigger than airplanes. It’s actually more challenging and fulfilling for me. What made you decide to switch from being a Flight Attendant? I used to play football quite regularly, and unfortunately I injured my knee. The doctor told me that if I chose to have surgery on my knee, it would take nine months before I could fly again. So I took a look at the calendar and realised that I was going to turn 45 in a few months. In the airline that I worked for, you’re allowed to retire at 45 with a decent retirement package. So I did that, and took the opportunity to embark on a new career. I chose hospitality because I believed that I had enough experience to be able to make guests happy, and at the same time I wanted to stay in the service industry – but in a different, larger capacity. So I went for a recruitment drive organised by Shangri-La, and that’s how I started my career in the hotel industry. Have you learnt anything new from working in the hotel industry? It’s only been a year, but I feel like I’ve learnt so much. I joined the hotel through a Professional Conversion Programme (PCP), where people from other professions are trained to learn about the hotel industry and housekeeping. That particular experience taught me a lot about housekeeping. To be honest, I wasn’t used to doing household chores before. But when I first joined, I spent a month cleaning rooms, vacuuming carpets and changing bed covers to get a better understanding of the role, so I can become a better supervisor and manager. The experience taught me just how challenging yet vital housekeeping is in ensuring that our guests are happy, and I really appreciate the effort my team puts in. I’ve also learnt more about the planning side of things, like how to utilise manpower efficiently. I’ve done my fair share of planning in my previous career, but things are at a much larger scale now. I’m still learning, but I feel like I’m getting there. How do you handle such challenging requests? Patience and proper planning. I’ll have to look at what we can do with the manpower and resources that are available. Sometimes we may be short on resources, but if I take my time to properly think about it, I can find a solution! What do you enjoy most about what you do? I love the pace of operations in the hotel. It’s quite challenging and exciting. At times, I have to go all over the hotel to make sure that everything is going according to plan. And things need to happen fast, so that you don’t keep the guests waiting. I enjoy that kind of pace; it keeps me on my toes when I’m working. You decided to pursue a Diploma in Tourism. Was there a reason why? I didn’t want to enter the hotel industry without having any qualifications or knowledge about the industry. Not only would it be more difficult to progress in my career, but it would also have been very challenging for me to perform my duties. So I looked at some schools, and finally settled on the WSQ Diploma in Tourism programme because I felt that it offered a good balance of theory and practical knowledge. I have about two more months left in the programme, and to be frank, it’s been quite difficult balancing studies and work. To go for classes and complete assignments after you knock off work – that takes a lot of discipline. 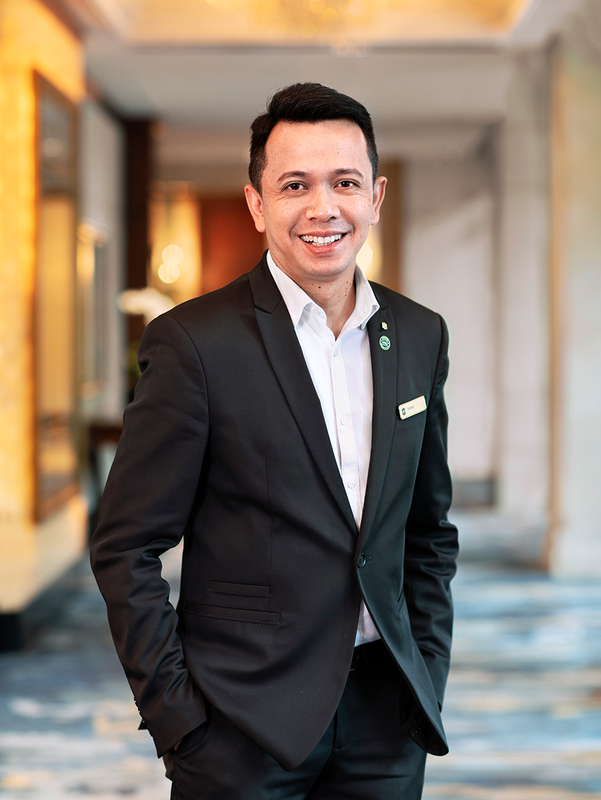 But what keeps me going is the desire to learn and understand as much as I can about the hotel industry, and the passion to do things better. Do you have any goals that you hope to achieve during your time in the hotel industry? I want to do my job well. Coming from a previous career with 22 years of experience, I think people have a certain expectation of me – how I handle certain situations, how I carry myself – and I don’t want to let them down. I hope that I will be able to enjoy what I do for a long time, and find fulfilment in this new career. What advice would you share with someone who is interested in joining the hotel industry? If you are looking for something worthwhile, where you can make a positive difference someone’s day, and experience the satisfaction of having people say “Thank you” , I would say, join the industry. It is a fulfilling career, and it will definitely challenge you to grow.